Dur: 4'08" / Cinema 4K HDR video with stereo audio. Made during a residency at SÍM Iceland. Australian video artist Adam Sébire brings wry black humour to global warming’s visible effects at one of the fast-retreating glaciers, Breiðamerkurjökull, in Iceland's Vatnajökull National Park: its astonishing iceberg procession is here reimagined as a traffic jam of cinematic proportions. The tideline on an island's black-sand beach is blown ever higher. Dur: 2'30" / HD single-channel, stereo audio. First exhibited as a work-in-progress at the SÍM Gallery in central Reykjavík during Nov/Dec 2017. 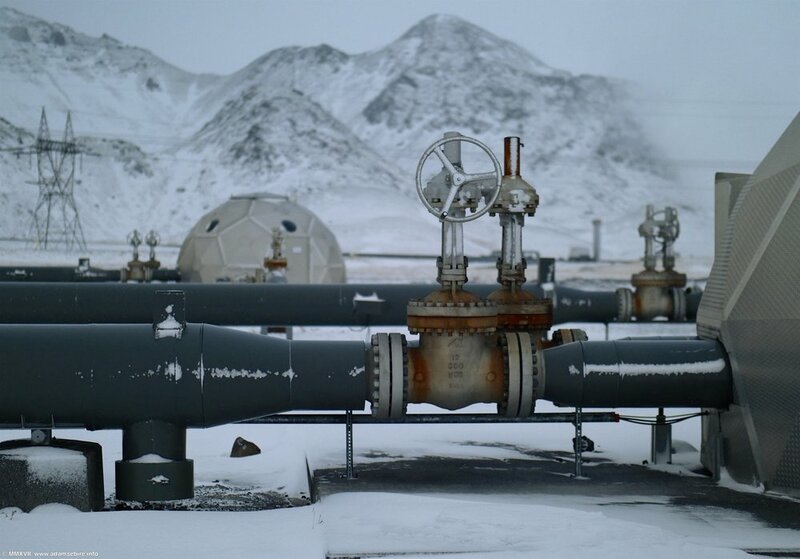 Composer Martin Franke & filmmaker/video artist Adam Sébire explore anthropogenic sea level rise in this work filmed with UAV (drone) off remote Eastern Iceland. Reverse motion creates an eerie prolepsis, a kind of previsional prescience of ever rising high tide lines. Video triptych, 2018. 3 HD screens (or 2 plus core sample in lit vitrine), 2.1 stereo audio. Duration: 3mins. 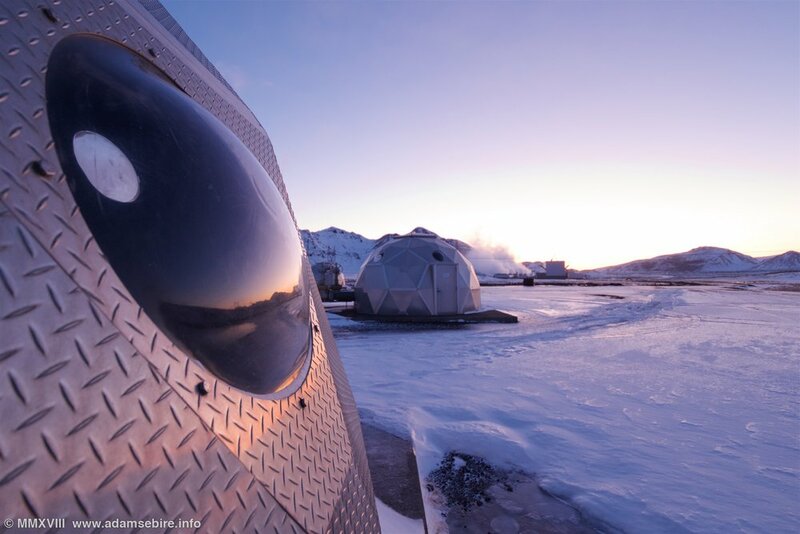 The Climeworks / CarbFix2 project at Hellisheiði, Iceland is the world’s first industrial-scale "carbon scrubbing" experiment that captures carbon dioxide (CO₂ ) directly from Earth's atmosphere. This CO₂ is mixed with water and pumped through domed injection wells into the volcano below, where it soon mineralises, petrified as rock. Most climate change policy tacitly assumes the success of such geoengineering experiments — despite their unknown long-term consequences. At COP21 in Paris, December 2015, the world’s leaders stated their “aspiration" to limit global warming to an upper limit of 1.5ºC this century. On the planet's present greenhouse gas emissions trajectory there is no way to achieve this without what is sometimes termed climate engineering: using technology — most of it unproven and with unknown potential side-effects — to “engineer" our climate. Installation view: première at the Deutsches Museum, Munich in October 2018 in the exhibition (Um)weltschmerz: an Exercise in Humility and Melancholia. 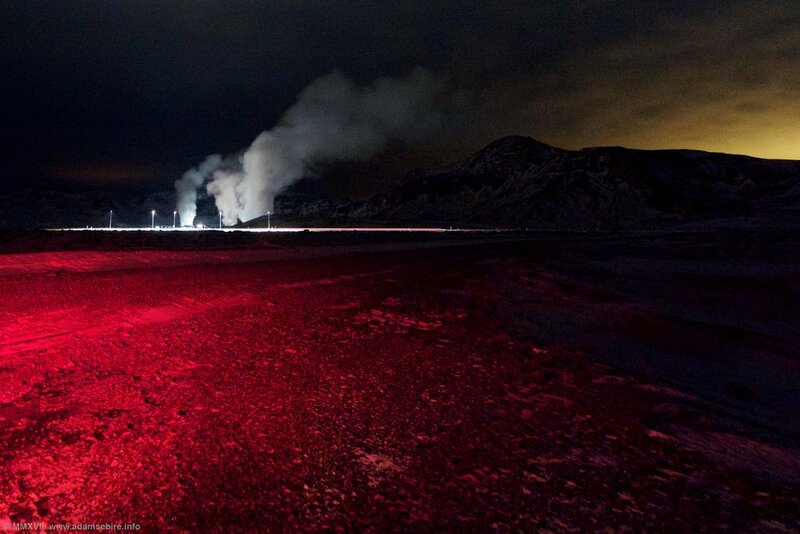 Carbon capture and storage (CCS) is arguably the most benign of these technologies. But despite being both difficult and expensive it has proven politically attractive as a “technofix”, delaying decarbonisation. Indeed all forms of climate engineering potentially come with what ethical philosophers such as Clive Hamilton identify as “moral hazards”. Other forms of geoengineering essentially propose that we "hack" the Earth's systems. 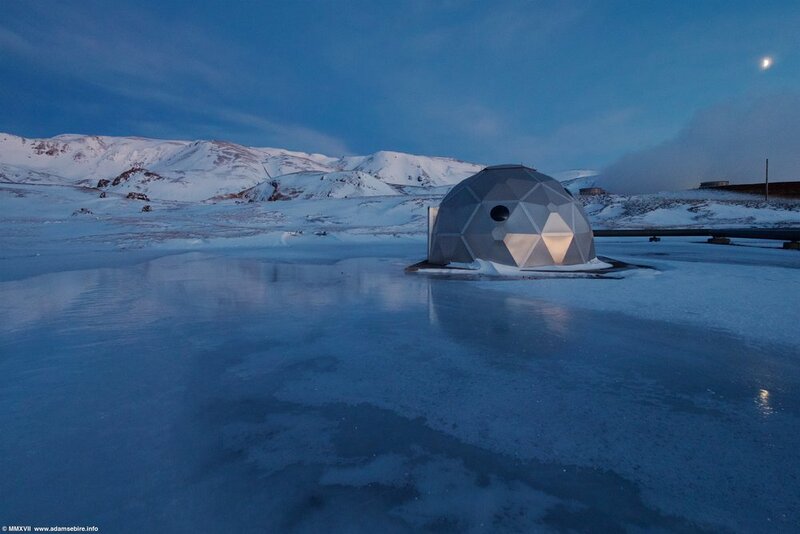 Hellisheiði in Iceland is the other-worldly site of the CarbFix2 & Climeworks projects. 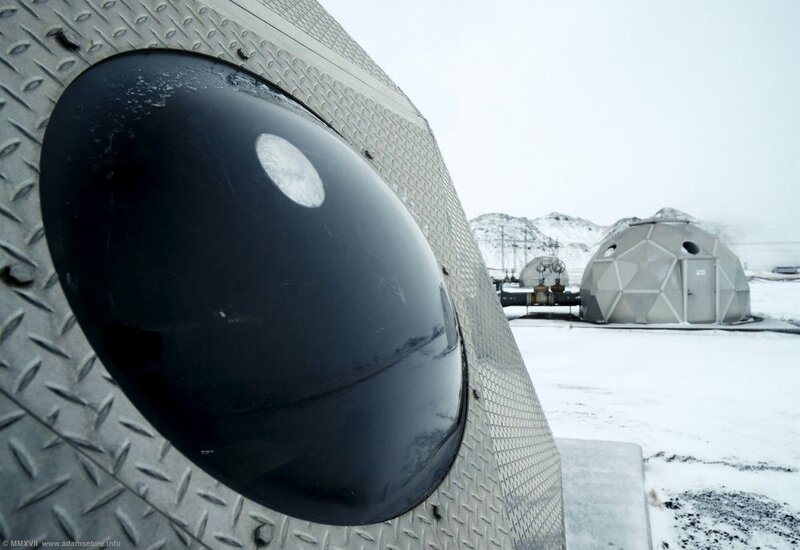 Since October 2017 this test site has been capturing carbon dioxide directly from the surrounding air. 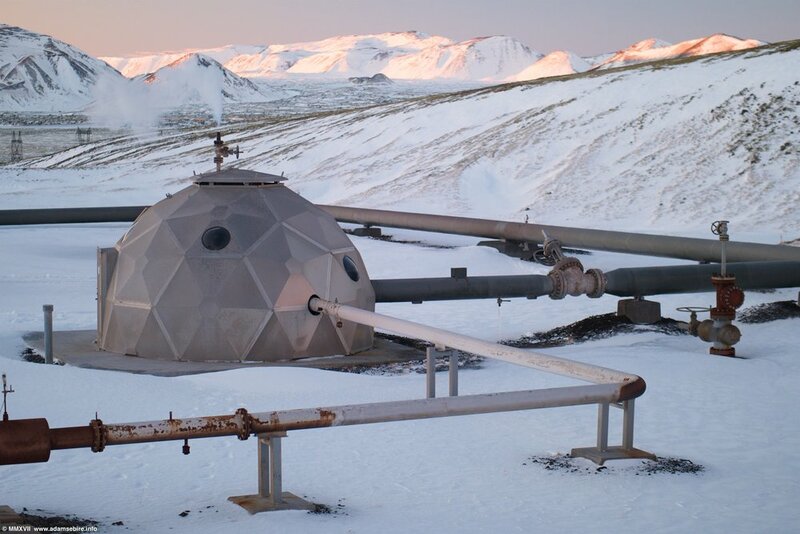 It mixes the captured CO₂ with water, injecting it via domed wells into the basalt rock formations surrounding Hengill, an active volcano, where it mineralises: anthropogenic carbon dioxide sequestered as rock. Australian video artist Adam Sébire is drawn to this site for its modern-day alchemy and for its Promethean overtones: an unshakeable faith in the technological mastery of Homo sapiens. In the video triptych, one of the three screens investigates the experiments at Hellishei∂i (the injection wells of CarbFix and Climeworks’ white cube “carbon scrubber” module). 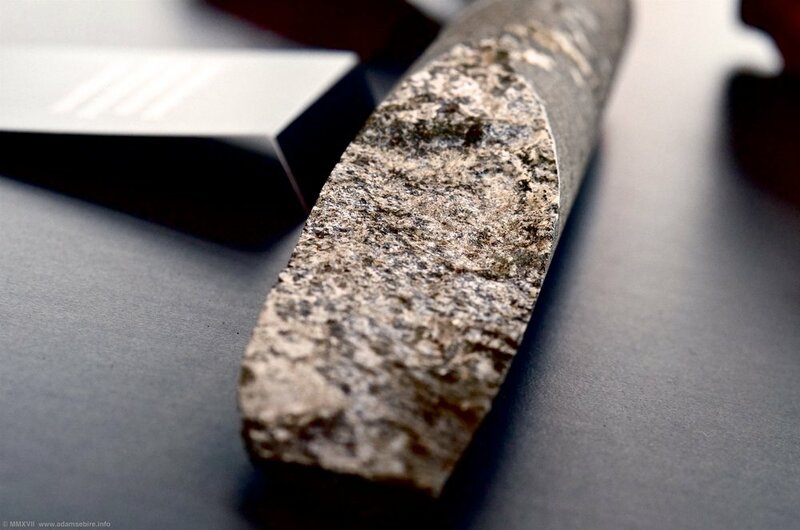 In another, a core sample of the sequestered CO₂ — now mineralised as calcite within the basalt host rock — appears as a quasi-mystical object. The third screen is more ambiguous: also set in Iceland, but in a future geological era where complex lifeforms have disappeared and where the planet appears to be correcting an atmospheric imbalance. Now, geological processes reverse. After only a few hundred thousand years, equilibrium — homeostasis — will have returned. This final screen may also be exhibited as a standalone vertical video, Homeostasis (see left). Dur: 2'18" / HD single-channel vertical video, 2.1 stereo audio. 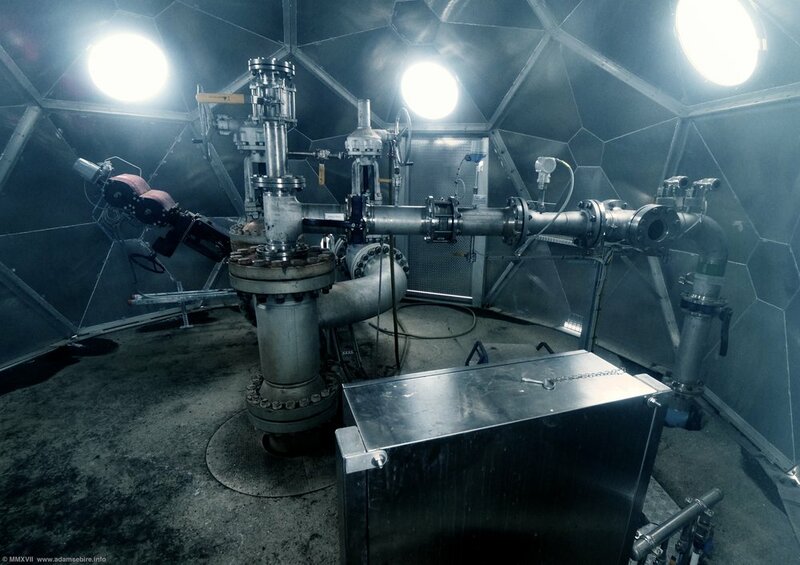 CarbFix 1 CO₂ injection test-site for carbon capture and sequestration technology. 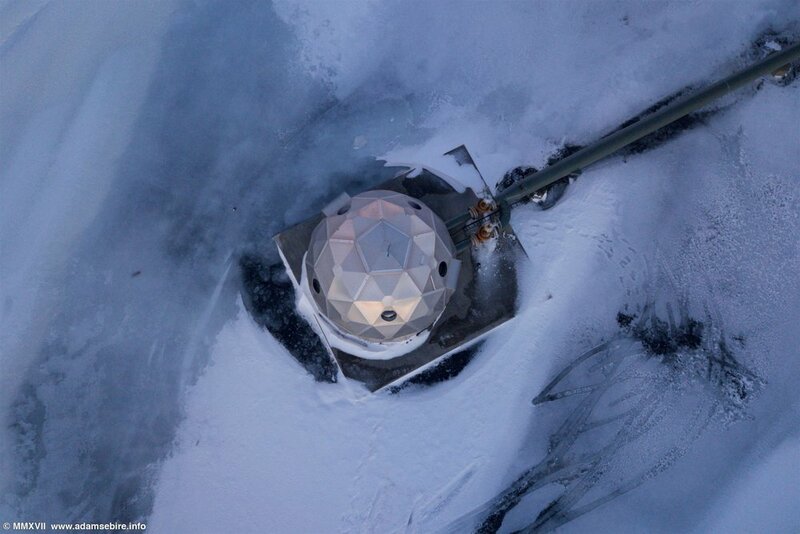 How do we know if we’re seeing the "fingerprints" of anthropogenic global warming on an event? 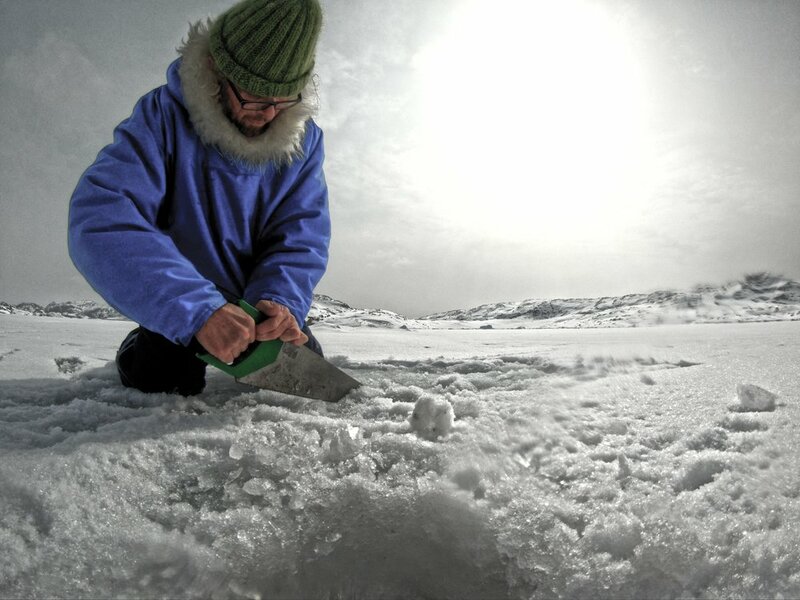 (This states that the area of sea-ice lost equals a constant — derived from research into surface energy flux at the ice edge — of 3.0 ± 0.3 square metres per metric tonne of carbon dioxide emitted, multiplied by the sum of emissions, some of which may remain in the atmosphere for over 1,000 years). 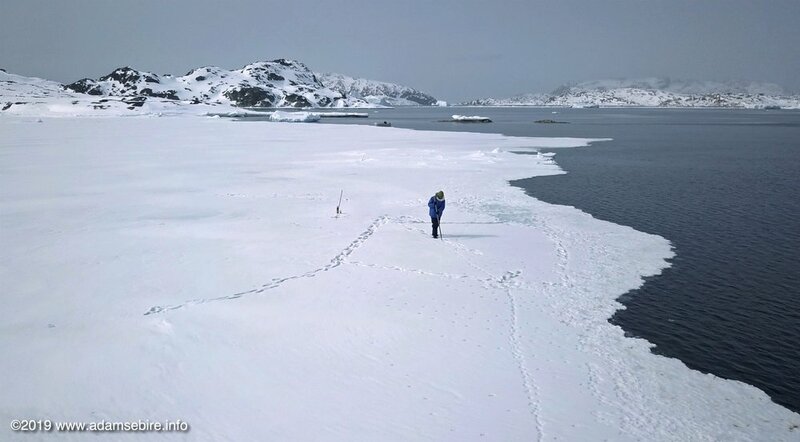 Inserting the artist’s own 5.23 tonnes of CO₂ emitted into the equation, this worked out at 15.69 ± 1.57 m² of sea-ice that would not regenerate naturally in northwest Greenland come winter. 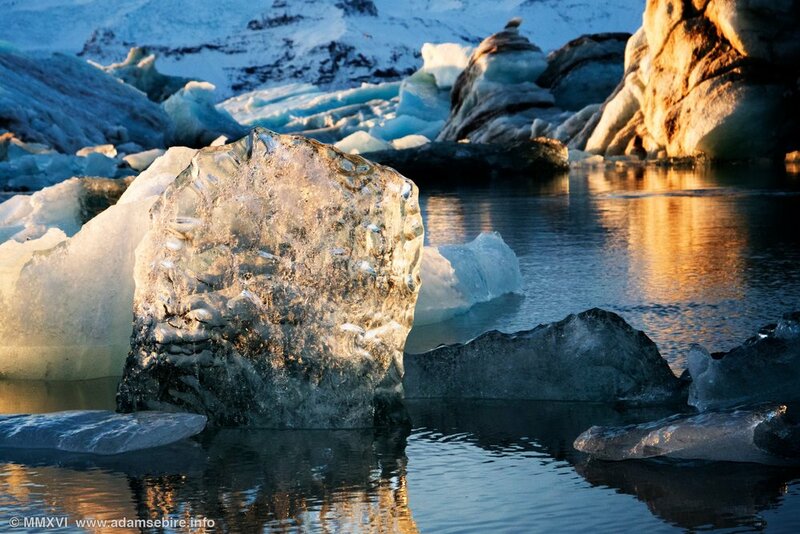 With less sea-ice to reflect sunlight back into space the oceans warm faster, which in turn melts more ice. This creates what climate scientists refer to (somewhat confusingly) as a 'positive feedback loop'. The soundtrack comprises æolian sounds from an empty water tank at the artist's house in Upernavik that 'sang' when it was windy. Multi-screen video art work for exhibition spaces, duration: 8’05"
• Video diptych (2ch) version: 2x 4K screens, 2x media players, stereo audio. Split-screen preview above. • Video triptych (3ch) version: 1x 4K screen; 2x HD screens, 3x Lūpa media players, stereo audio. Split-screen preview below. * Notz, D., & Stroeve, J. (2016): Observed Arctic sea-ice loss directly follows anthropogenic CO₂ emission. Science, 354, 747–750.